Do you have a 1924 penny and want to know how much it’s worth? Maybe you’re trying to find out if you have one of the rare 1924 pennies worth more than $25. Or, perhaps you have a bunch of other old wheat pennies and want to know if you should be paying closer to attention to those 1924 Lincoln cents. If you found a 1924 wheat penny in your pocket change and want to know what it’s worth you’ve come to the right place! How Much Is A 1924 Wheat Penny Worth? 1924 pennies are worth anywhere from 15 cents to more than $100. The value of your 1924 wheat penny depends on where it was made. This can be determined by looking for the presence or absence of a mintmark under the date. 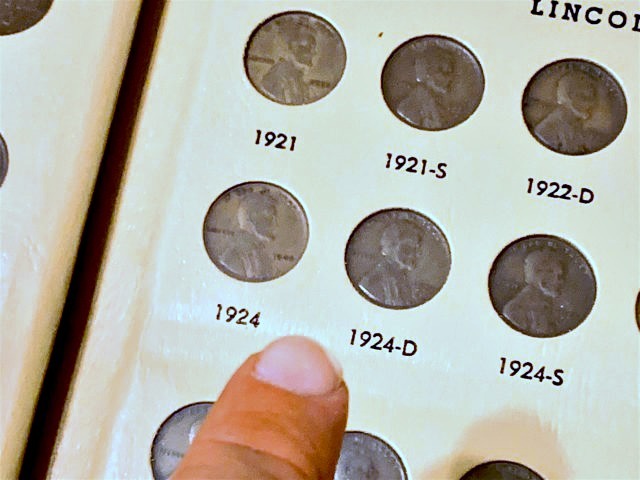 The most common 1924 Lincoln wheat pennies were struck at the Philadelphia Mint and don’t contain a mintmark. A total of 75,178,000 were struck. A no letter or no mintmark 1924 penny is worth about 15 to 50 cents in well-worn condition. The 1924-D penny is scarce, as only 2,520,000 were made and perhaps just 7% to 15% survive. A well-worn 1924-D penny is worth about $30, whereas a nicer specimen exhibiting only slight wear has a value of $125 or more. Finally, there is the 1924-S penny. With 11,696,000 pieces struck, the 1924-S penny isn’t nearly as scarce as its Denver-minted counterpart. A 1924-S penny is worth anywhere from 75 cents to $75, with higher values going toward coins with only light traces of wear. It’s worth noting that all 1924 pennies were struck for circulation purposes — meaning there are no known proof pennies from 1924 that were made for collectors. Are There Any 1924 Wheat Penny Errors? Yes, there’s at least one confirmed 1924 doubled die penny. It’s been found among some 1924-S pennies. Another possible 1924-S doubled die shows doubling in the date on the obverse (heads side). Values for these doubled die pennies range from about $20 to more than $100, depending on the variety and condition of the coin. J. Edgar Hoover became head of the Bureau of Investigation, later to be known as the Federal Bureau of Investigation. Serving for nearly 50 years the head of the FBI, Hoover helped take down gangsters in the ’30s and hunted for Nazis in America during the ’40s. His efforts to thwart communists in the ’50s and investigate civil rights leaders in the ’60s and early ’70s saw criticism, but his record 48 years as FBI head has permanently implanted Hoover an iconic law figure. Two US army planes completed the first round-the-world flight in 175 days. Ellis Island in New York City closed as a port of entry for new immigrant arrivals coming into the US. Astronomer Edwin Hubble determined the Andromeda Nebula is a galaxy, suggesting there are other galaxies beyond our own Milky Way. Musical greats Ira Gershwin, George Gershwin, and Irvine Berlin were still making new music in 1924, with the song “Rhapsody in Blue” debuting that year. Top movies in 1924 included Sherlock Jr., The Thief of Bagdad, He Who Gets Slapped, and Girl Shy.